To support the development of the Shotley Pier community share offer to purchase and restore this historical landmark for future use. The members of Shotley Heritage Community Benefit Society operate with a one member, one vote system to make decisions about the running of the business. 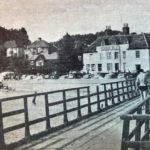 Restoring the pier will improve this area designated an Area of Outstanding Natural Beauty and attract more visitors to spend time in the local area. The renovation of the pier will create several apprenticeships to give young people skills to enter the regional industry of coastal civil engineering and stimulate the local economy. 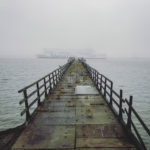 Built in 1894, Shotley Pier used to have a railway line so that mail, munitions and sailors training at the world-renowned HMS Ganges navy base could be ferried across the Stour Estuary in Suffolk. Over time, the 182 metre Victorian pier fell into disrepair and was put up for sale. 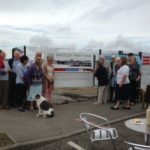 In 2016, local people set up Shotley Heritage Community Benefit Society (CBS) to save the pier, raise funds to buy it and restore the pier into a working attraction where people can stroll, fish, and enjoy the amazing views down the Stour and across to Harwich and Felixstowe docks. The group estimate around £300,000 is needed in total to get the pier up and running to its former glory. Campaigning started with fundraising and awareness raising events in the area, from pub quizzes, to an Art Around the Pier week culminating in the auction of art, and the Napoleonic Living History weekend. Power to Change awarded Shotley Pier professional support and a £5,000 grant to develop their share offer, through our Community Shares Booster programme. Ahead of launching the community share offer, members of the group took pledge information all over the peninsula, with leaflets placed at all the local pubs, garages, parish magazines and local businesses. Within days, people were responding with their own passion for the pier, pledges started arriving. 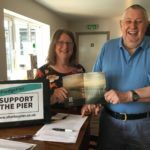 £45,000 was then raised through community shares, and were matched by Power to Change up to £62,015, bringing the total raised close to the £100,000 needed to purchase the pier. After that, Shotley Heritage CBS will be able to employ a contractor, and create civil engineering apprenticeships, to restore the pier. Volunteers will be involved in painting and repairing the pier too. Members will have an ongoing say in how the pier is developed and run, with a one member, one vote system. Once it’s restored, the pier will be a natural destination for birdwatchers, amblers and fishermen as well as residents of the newly developed HMS Ganges site, in this designated Area of Outstanding Natural Beauty. Income will be generated through selling Shotley Pier merchandise such as their very own Shotley Pier rum, potentially running boat and ferry services, letting out space and hiring out the pier for events such as weddings. All this is to be decided once the pier is purchased. But keep an eye out for this pier with potential.